Tired of arguing with leftists, cultural Marxists, SJW’s, degenerates, and cucks? Tired of getting angry over hearing the stupidity of what they say and also catching their own internal negativity? Well now there’s a way to make listening to them fun while undermining them at the same time. 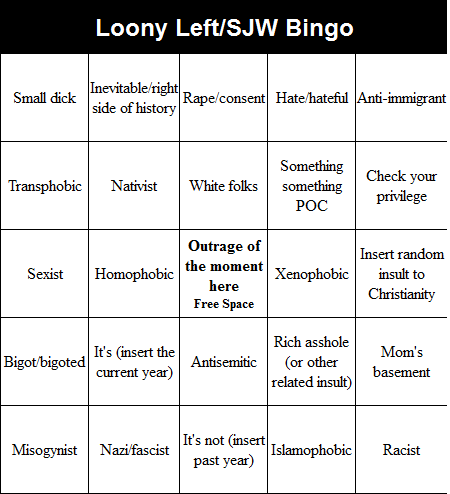 All you have to do now when you encounter an SJW clown is use this bingo card. This turns what can be a negative experience into fun, and also subtly mocks the stupidity of their arguments. Get the full card or generate your own here.